Is a Pacemaker/Defibrillator a Contraindication to MRI? As our population is getting older, more patients rely on cardiac-implanted devices. It is common to see these patients in the spine clinic, where advanced imaging is required for accurate diagnosis. Is it safe to use MRI in these patients? The current practice is to avoid Magnetic Resonance Imaging (MRI) in these patients since the presence of an implanted cardiac device is considered a contraindication, which in result, would harm the patient. 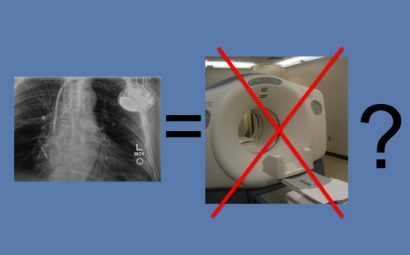 Consequently, patients with these cardiac implants have to undergo a CT myelogram, an invasive, lengthy and expensive procedure with significant radiation exposure. The article’s conclusion was derived from an investigation performed on 1,509 patients at the Johns Hopkins Hospital and essentially found that 1.5-Tesla MRI is safe in patients with pacemakers and defibrillators. All of the patients tested had a standard non-MRI-compatible implanted pacemaker or defibrillator and underwent MRI of different body parts, including thoracic spine. After MRI was performed, 99.6% of these patients did not have any changes in their device function. In 0.4% of patients, the device reset to a back-up mode. There were no long-term clinically significant adverse events. Based on these new findings, spine specialists, including myself, may consider MRI instead of CT myelogram in our patients with cardiac devices. While endorsements by the American College of Radiology, American College of Cardiology and American Heart Association will likely be required before this practice is widely accepted, I suggest we give this matter some attention. * Safety of Magnetic Resonance Imaging in Patients with Cardiac Devices: Published in New England Journal of Medicine in December 2017. PMID: 29281579.